Although I’ve been fantasising about building my own home for 10 years I’ve never done it. I’ve lived in a car, a yurt and a van in the past few years, which involved some building, so my designs are improving. Even though I’m not currently in a position to build anything, lately I’ve been researching existing designs and am in the process of creating designs for 3 dream homes. 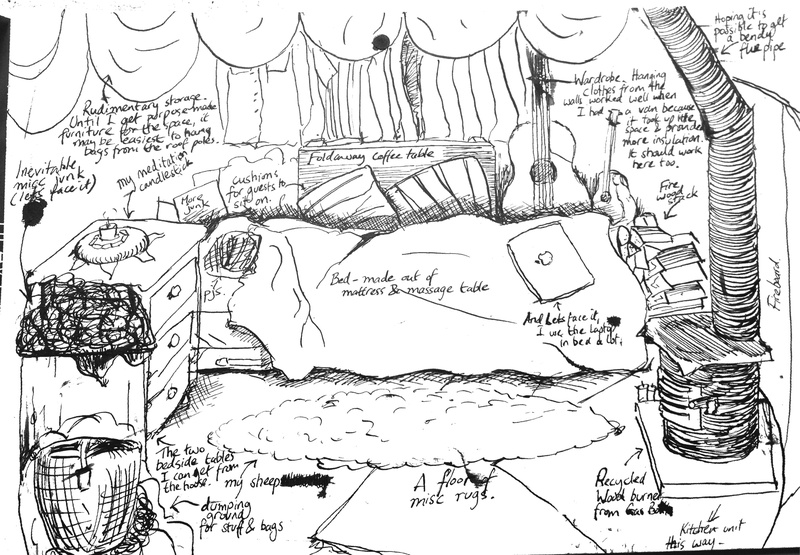 Preliminary sketch of yurt interior. I made this 3 weeks before buying my yurt. Ever since I got my first teaching job and started renting 10 years ago, I’ve wanted to live in an alternative dwelling. I just couldn’t believe it – my rent & bills totalling half my income, and after tax, car bills, having only £50 per week left over for food, fuel, clothes and everything else. This wouldn’t have surprised me if I was being paid minimum wage, but I had a graduate job, and was no spendthrift. I couldn’t understand it. At the same time, my friend had just moved into in a tiny boat he’d bought for £3k, and which cost him only £17p/w to moor, including electric. Before I reveal my designs, here are some of my principles when it comes to tiny house design, explained through some of my pet peeves about designs I’ve already seen. Keep it tiny! Many tiny dwellings seem to be larger than a London bed-sit, with some being as big as 300sq ft. This is too big. To me, part of the beauty of a tiny house is that it can feel like a nest – minimal, so you know where everything is. My last van was 65sqft and my yurt 115sqft. I own a lot less stuff than I did when I lived in either. This was how it really turned out. Keep it cheap! Some tiny houses can cost over £30k, and require professional builders to construct them. To me, this takes all the joy out of it. Not only would it take me 30 years to save that sum, but I also want to build my home myself. The most exciting tiny house builds I’ve seen have been from recycled materials. Sure, this takes longer, but self builds of this kind also seem to include very basic design, meaning the owner can fix/replace anything in the space, and make changes if they see ways to improve the design after having lived in it for a while. The slowness, whilst the on-going search for materials continues can also be a good thing, as you design a space whilst living in it. I lived in my first van for 6 months with only a cheap Ikea bed screwed to the wall, and then built furniture piece by piece as I discovered what I needed. The finished design was totally different to what I would have envisaged if I’d had to build the whole interior before moving in. Avoid pull out furniture where possible: Multi purpose items save space but to me, pull out furniture is a bad idea. If the sofa needs to be pulled out to become a bed, this means having to make the bed every night and often the quality of the bed is compromised so it will it fold. Fold out tables make slightly more sense, but really, most of the time, you do need a table. It’ll either be acting as a desk, or a dining table. Once I shared a van in which the bed folded down into a dining table and seats. The result? There was no way we were going to fold away the bedclothes and set up the table every single day. We just ate sitting in bed. I believe there is enough room for furniture in a small space as long as you don’t try and include more than you really need. Avoid beds in lofts? I’m still on the fence about beds in lofts. Once, when I lived in a van I twisted my ankle, and then just getting in and out of the van became a chore. I can’t imagine what it would have been like if my bed had been up a ladder! I also fell ill once or twice – again, the same problem. Although high beds make sense in terms of saving space, tiny homes are living spaces, not holiday spaces, and that has to take into account that you may not always be in the peak of health. A space should feel like the person who lives there. I want to be surrounded by my stuff because that’s how I know I’m in my own home and not somebody else’s. When I visit someone, I want to get an impression of their character by their home, not a clinical showroom look. 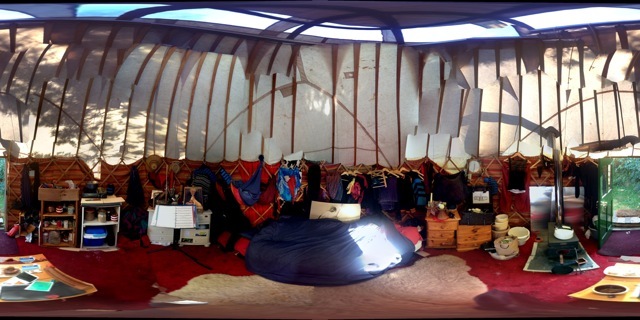 Panoramic picture of yurt interior – most possessions visible and decorative. Hidden storage encourages people to shove junk in a drawer and never look at it again. Having it visible means it’s harder to hoard. It’s also easier to find something you’re looking for. Rather than wondering which drawer it’s in, store the things you use most often out on surfaces. I can’t understand people who have clear surfaces in their houses. Aren’t surfaces for putting things on? Your stuff should be beautiful to look at! A minimal space doesn’t have room for both functional items and decorative items. The best way to make it look vivid is to decorate it with your things. 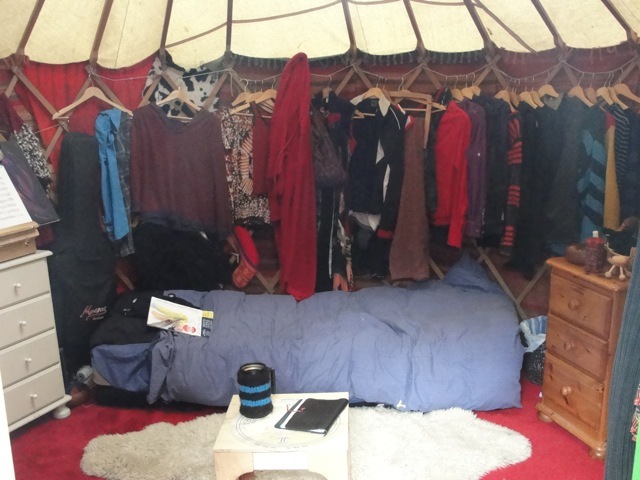 As you can see from these pictures of my yurt, my clothes, especially hats and scarfs become display items. Things are kept in brightly coloured bags hung from the lattice. Jars for pens and knitting needles are decorated. I like bright colours, but there’s no reason someone couldn’t apply the same ideas to a more tasteful colour scheme. Don’t pretend that a tiny home is a miniature version of a big home: Campervans and caravans are guiltier of these design flaws than proper tiny homes, but it’s a common mistake to try and include miniature versions of everything in a small space. A good example is a four-ring gas stove, grill, oven and sometimes even a microwave in a van kitchen. Really, that’s only necessary if cooking for a large group. No dwelling that relies on a solar-leisure battery system should include a microwave or an electric kettle. If you want to live tiny, it’s best to start by admitting that you can’t have everything you’d have in a normal house. Decide what you can live without, remove it from the design and you’ll soon find your have enough room for everything you need. For example, a house that’s less than 100sqft definitely doesn’t require a hoover – a stiff brush and dustpan will do the trick. Soft furnishings can be aired and beaten outdoors. If you still want to deep clean, borrow a hoover every few months. For cooking, I’ve been happy for years with a single ring gas stove (and wood burner where possible). I even learned to make toast in a frying pan. If you need more than that, include it, but be willing to adapt. Don’t just include something because you’re used to it, only include the things you’d otherwise miss. Stay tuned for my designs. In May last year (2014), I was preparing for a summer in Europe, mainly France. I aimed to meander around, busking and having adventures. Instead, I changed tack and ended up staying in the UK to conduct a self-designed lifestyle experiment: The £0 Challenge. Over the summer, I ran out of money on purpose and built my way back up to a healthy bank balance without begging, borrowing or stealing. By the end of August, I had released an album through crowd funding to the tune of £2k – enough money to set up a pay-what-you-want based mobile recording studio. A year later, I’ve just returned to Exeter after a summer holiday – guess where? France. A charming holiday home which used to be a hen house! This feels especially significant to me, because last summer I’d abandoned a trip to France, because it was the wrong time. At that point, it would have just been an escape, after which I’d come back to a life that needed to radically change. I’d have likely come back in debt with no idea what to do next. This summer was different. 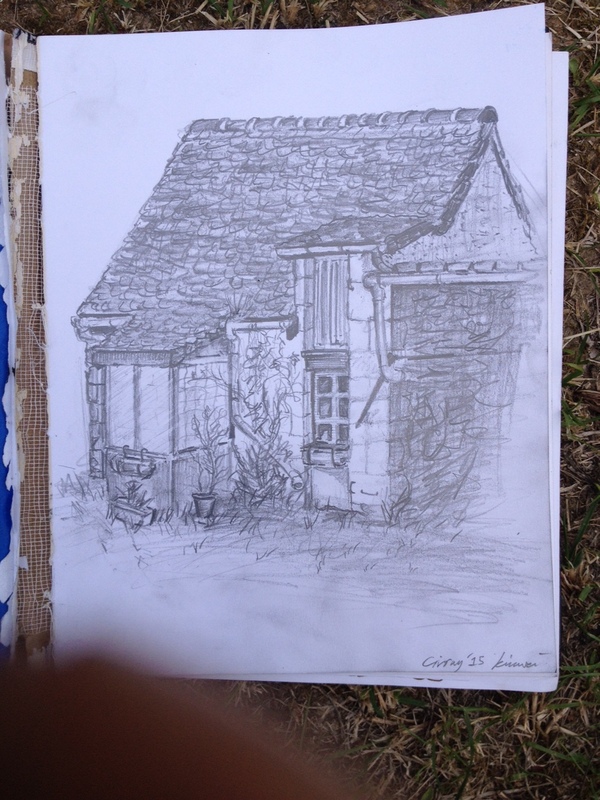 Going to France wasn’t an escape from my life, it was part of my ever evolving post-£0-Challenge-LIFE. It was the first summer since graduation that I didn’t struggle for money, allow me to take my first real holiday in five years. Sure I travel all the time, but holidays are different because they involve resting! This trip was part of my life, because it didn’t break any of my connections back home in the UK. I stayed in touch with my clients, booked appointments for the next month – normal service ticked on. Even the amazing three bedroom farmhouse I stayed in belonged to a student of mine, who knowing of my lifestyle, invited me to stay in her holiday home practically free of charge. It felt good to be able to help her with physical tasks and repairs during the stay – just the sort of exchange I’ve come to really value. It feels like give-give. None of this would have been possible a year ago. It felt like a true realisation of how my life had evolved post-£0. I felt confident. This didn’t stop me having a crisis on arriving home and being handed a £700 MOT bill. I wandered morosely around the supermarket, trying to shave a tenner off my weekly food shop, just like I used to during teacher training. They were right. After a couple of weeks realised that I had plenty of exciting work planned for the new academic year that would pull me out of the rut pretty soon. Although I fell back into under confidence for a couple of weeks, it’s important for me to remember that I used to think that way all the time. The £0 Challenge has had a huge effect on me, so much so that returning to my old fearful way of thinking is nothing more than a temporary dip.